Of course, five years later, we know that all eyes are on Shockoe again, again. This article was a good reminder of the many hours spent designing plans that were never completed. In the past year this design seems to have been generally forgotten and replaced by another less-ambitions (albeit beautiful) design for a slavery commemoration in Shockoe Bottom. I tend to agree. It’s no surprise that I’d rather Richmond move forward with something exceptional than settle for something acceptable. Besides, there are examples of projects of that scale in this country that were funded by a combination of state, local, and private funds. I continue to believe that good ideas of far-reaching significance energize donors more than anything else. How can one city generate so many incredible, unfinished designs? On the one hand, this is just a factor of the architecture industry. An astounding number of designs are submitted every year that are never realized. But it still seems to point to a deeper issue of governance that prevents us from connecting the plans to reality. Every so often I stumble upon another great idea for Richmond that somehow never found funding or political momentum. And now we have this “economic development plan” for Shockoe Bottom that seems to be moving in the same direction. So what can we do next time to prevent the same results? A fledgling museum should begin with a mission statement and a plan of whether it will be a “collecting” institution — one that houses a vast collection of artifacts for display and research — or a “storytelling” institution that strives to communicate knowledge and an experience to its visitors. “All of these things start coming up that will have an incredible impact on the long-term operations,” [Coleman] says. We ought to extend this wisdom to any large-scale project brought forward for the benefit of the people of Richmond: start with your mission statement. What is the essential purpose of the development and how will it serve the needs of the city? As we have seen, there are many architects and firms in the area that are more than willing to turn a good idea into sparkling designs. They might even do it at a discounted rate if they are particularly inspired by the proposal and assured that this time there is a likelihood that the project will actually happen. This city has incredible potential, regional powerhouse corporations, and visionary leaders. Together I truly believe we can make something great. But first, we need a good idea. There was a time when Detroit was in worse shape than today. In 1805, the entire settlement burned. 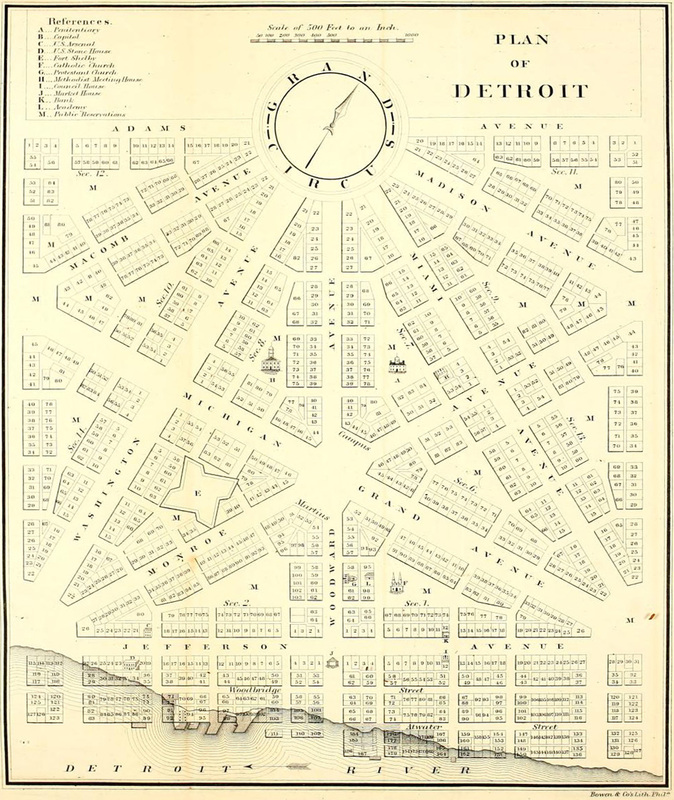 There may have remained remnants of buildings and streets, but for the most part, Detroit was simply a memory. In the two centuries that followed, this city grew to nearly 2 million residents and has now shrunk to a little more than 700,000. It’s easy to look at Detroit today and marvel at its losses. But we have to remember that fire. When Detroit lost everything, before the world knew her name, one person rose to draw this vision. He found inspiration in another great American city and drew a plan that became the backbone of an empire. It remains mostly intact to this day. While bulldozers roam the city demolishing abandoned buildings by the 10,000s, as the earth returns to prairie as it was found over 300 years ago, residents of the city are wondering what could possibly become of this place. When I visited in 2013 I met so many people excited to tell me about the recent improvements: new jobs, new businesses, arts and culture. A few months later, the city declared bankruptcy and Kevin Orr took control of the city’s fate. I’ll be going back to Detroit this summer and I can’t wait to see what has happened in a year: to walk around and experience it for myself. There’s so much to learn in that place: inspiration, caution, fuel for my endless curiosity, and context for the situation in Richmond and other American cities. Until then, I’ll be wondering how a Shinola watch can cost $950 while this house was recently listed for $100. Until then. I just stared at that settlement on the banks of the James River and wondered what the next 400 years might bring. In the city of Richmond, there is the past, the present and the future. That makes us fortunate and it makes us complicated. To move forward, we will have to make some sense of ourselves and our story. 1. Current events in context: If I ever write about current events, it will be to analyze and contextualize the story. I spent three years studying the debates in Richmond regarding the construction of the Richmond Petersburg Turnpike. That work left me particularly interested in economic development strategies and plans for improving the American city. 2. Drawings for the future: Like many of us, I’m constantly imagining new uses for old spaces and I’ve decided I’m finally going to get these on paper. I’m actually planning to draw them out. It will probably be pretty ugly at first, but I’m hoping to read a little on technique and improve over time. 3. The psychology of the city: I’ve been noticing for years that the city of Richmond has a certain personality. This personality comes out in furious debates as well as mundane daily life. Since college I’ve also entered the world of cognitive psychology, therapy, management, and organizational behavior. I’ve read books, met with academics, and watched every video I find. Insight from these fields will be my lens for understanding what’s going on in this crazy place. 4. The history of the history: There are so many stories being told about Richmond. I want to take those stories and study them to understand the different ways that we describe ourselves. I’m obsessed with historiography and excited to dive back into that field for a series of posts about the different ways we talk about our past. This is connected to the psychological perspective as well: how we talk about Richmond says a lot about how we think of ourselves. I want a future for this city that is unique and authentic. I want Richmond to develop a maturity as a place that takes all of it’s qualities and integrates them into a coherent whole. As with personal development, this will require a lot of work. In a way, collective therapy. And all because we believe there is a best possible future for this city and that future must include a coherent, honest, and accepting understanding of the past and present. For the past several months I’ve been hearing an “access to jobs” argument for regional transit in the Richmond Region. This argument proposes to connect poor residents in Richmond with entry-level jobs in the surrounding counties. I’m afraid this approach will not be received well. Wow. Is that how they managed regional public transit in other cities? By shaming municipalities into investing into something that their own residents don’t yet desire? Is that how we make decisions in Richmond? Do the counties even need Richmonders to fill those jobs? Something tells me that if the entry-level jobs in the counties weren’t being filled employers in the counties would be pressuring their local leaders for regional transit. I have heard no such demand. I am 100% committed to advocating for a more efficient system of transportation in this region. I am open to the idea of BRT being the model for that system. I want more density, more connectivity, and healthier communities in Richmond. But I don’t think that framing this particular initiative as a social justice issue is going to get us anywhere. Is it a social justice issue? Of course. People should not have to own a car to get a job. Is that the best way to approach the topic with our more conservative and flighty neighbors? The one benefit that I’ve heard mentioned, economic revitalization, should be more celebrated and emphasized! Transit-oriented development has incredible potential in this low-density region and streets like Hull and Broad are full of vacant lots ready for new development. Also, in order to make transit viable we’re going to need the density of nodes along the BRT corridor so it’s integral to the success of the project itself. I don’t want us to see public transit as an indulgence that the suburbs have to buy in order to cover their sins of wealth and security. Public transit is a relaxing, efficient, and social way to travel. In the past year, I’ve made new friends, reconnected with acquaintances, and laughed with my coworkers on the bus to and from work. I love the bus and I invite the rest of the region to consider whether more of our neighborhoods should enjoy access to public transit as I do. In short, public transit is a party and everyone’s invited. It’s just that some in this region are going to have to drive to get there. As a resident of Richmond for the past five years, I have had the privilege of living through an exciting and dynamic season of change. It seems that after about 60 years of condescension and loss, it’s becoming a good time to be an American city. It’s a good time to be Richmond. So, with that in mind, I was a little surprised when I read three editorials recently published in the Richmond Times-Dispatch addressing the “issue” of the view of Richmond from the highway. As I read each article, I felt that importance had been placed, not on the city, but on the opinions of passersby. This editorial is a response to those articles and perhaps generations of similar articles that have come before them. I believe that before we have a conversation about Richmond, we need to have an understanding of how the city changed during the twentieth century and more importantly what changed about the way we talk about cities in general. My undergraduate education on the urban crisis in America presented changes in the city as a process of politics, prejudice, and technological advancement. More recently, I have come to understand the urban crisis as a gradual shift in investment and perception that took the American city, a source of pride, and turned it into a mark of shame. Furthermore, I understand the urban crisis as a rhetorical war between old and new. The goal of the war, as with any, was to frame the other as “backward” and the self as “progressive.” While Richmond attempted to maintain dignity, new technologies seemed dissatisfied with older cities: You’re too compact, too dilapidated, too prone to riot and rot. As each new suburb was developed it became yet another statement to the American people pointing toward the promise of new, more civilized places with room to roam and play. Within this promise there was also a clear distinction being made from the archaic, dark city where most Americans at the time resided. As with all major shifts, the new way of doing things had to work to undo the more traditional ways of life. Many believe that the post-war zeitgeist of modernization, on a national level, did much to shift popular opinion. But on a local level, citizens of the Richmond metro-region still had to prove to residents that there was a more abundant life to be lived on the other side of the city limits. This was accomplished through a series of events: The celebrated opening of Willow Lawn Shopping Center (1956), the construction of the Richmond-Petersburg Turnpike (1959), the failure of plans for consolidation with Henrico (1967) and other semi-related moments along the way. Each of these also had their corollary effect on the life of the city exemplified by events such as the closing of Miller and Rhodes/Thalhimers, the destruction of urban neighborhoods, and the political isolation that conclusively trapped and humbled this once-proud American city. As money and people continued to migrate to the suburbs, local officials turned their attention from annexation to urban renewal. “If we can’t have the suburbs,” I imagine them thinking, “we have to do something about this city.” But rather than invest in what already existed, they fixated on dreams of what could be. “We get it” they tried to say “and we’ll fix it,” just don’t move your family to the suburbs. As Silver writes, the city then “embraced urban renewal with a sense of urgency unprecedented in Richmond … Consolidation would have afforded vast new areas for growth and would have enabled the city to continue its policy of neglect toward inner-city areas” (254). Now left to embrace the demands of reality, Richmond’s city fathers sold out and destroyed much that today would protected as historical. They were always looking to what the city could be rather than accepting the city as is. To me, this moment of urban renewal was a sign that the suburbs had won the war. This was the point in the story where it was finally decided that new was in fact better than old: Look! Even the city hates the city. In the decades that followed the tumultuous 60s and 70s, much has been said of the potential of cities, but almost all of it with the understanding that cities have something to prove. To this day, the standard to which Americans hold their cities is strangely high while their commitment to funding urban institutions and infrastructure is remarkably low. As Kunstler might argue, this is because we are no longer a nation of citizens; we are a nation of consumers. Additionally, it seems that many of us have a powerful aversion to cities because we’re still trapped by the negative stigma established all those years ago. While local boosters proclaim, “Richmond is a city of art and great food!” critics reply, “Parking lots! Potholes! Prostitutes!” And regardless of their merit, these conversations do little to change the paradigm. In this sadly familiar conversation, the subject is always “the city.” The place that needs to change is the city. The place that we want to love is the city. But this is not the perspective of an insider. Instead, we need to recognize that this critique is one of suburban condescension. The suburbs are still trying to prove their worth and their legitimacy and they are still quick to do so by orienting themselves against the “corrupt” and ” inefficient” locality they are ashamed to call neighbor, but delighted to visit for a basketball game. We cannot have a productive conversation about Richmond until we move past the negative stigma that outsiders have placed on the city and begin to see Richmond as good once again. We should welcome visitors to come and enjoy themselves in the city, but our ultimate concern must be with the needs and desires of existing residents. Developments in Richmond should be for the city, not at the city’s expense, because that is what we can sustain and appreciate. And no longer should we consider developments for someone else to enjoy. We have nothing to prove and everything to gain. A couple of months ago, I posted a quote from MacBeth that included the phrase, “this ignorant present.” I posted it because, for some reason, the idea really struck a cord with me. 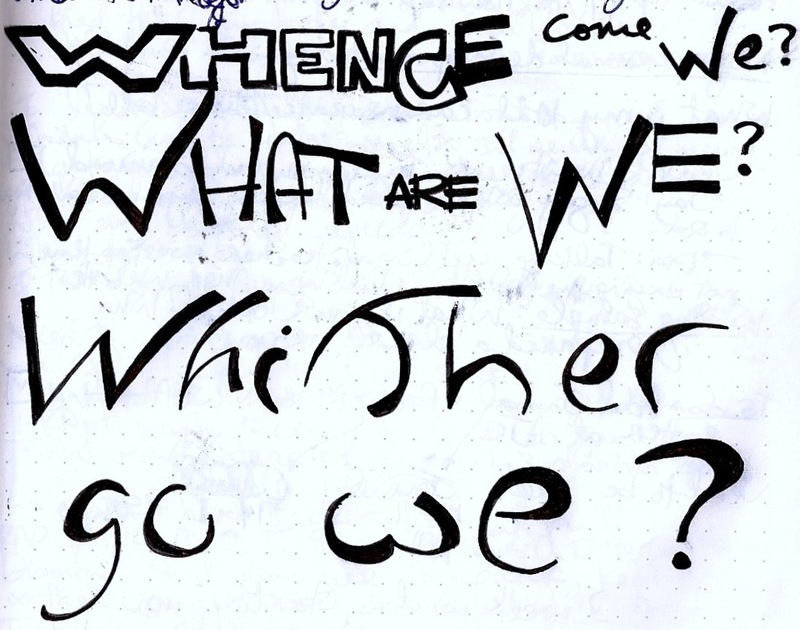 Everywhere I go, I am asked variations the same question, “What’s in store for next year?” When I was a senior in college, I was asked this question. When I was a senior in high school, I was asked this question. I think before every big transition I have been conditioned to receive this question with either evasive answers or a scattershot of ideas and possible directions. Rarely (besides the college acceptance) have I been the sort of person to have an answer. Now, because I am currently working in a one-year program, the questions about the future have sort of carried on right through college graduation and into this year. And I’ve noticed two things about this process: 1. Questions about the future make me uncomfortable and 2. I find myself asking these sorts of questions all the time. And then I started to wonder if maybe we are sort of all collectively making each other feel uncomfortable or unsatisfied with the present. Am I simply hoisting my discomfort onto my friends by asking them the same question that I myself am tired of hearing? Often, rather than enjoy the present, I am thinking about the future and I find that this ignorant present doesn’t seem to deserve our time in the context of the grand future we are supposed to be planning for ourselves. I know that lots of times these questions are well-meaning (or maybe an attempt on my part to make casual conversation), but I’m tired of the question and I want to respect the present. I want to appreciate the present. I also intend to put in serious work getting to the next step of my life … and I understand that I will always need to prepare for the future. But maybe I’m telling myself this as much as anyone else: the present is what we have. Conversations about the future, regardless of their intent, seem a bit assuming. This is, after all, the human experience we’re talking about so no matter what answer I give you when you ask the question (you know you want to) it’s with the understanding that life is going to happen regardless of what I say. So at this point, that seems like the only legitimate answer about what the future holds in store.